Q-Symbio, a large international study involving heart patients has hit the headlines. 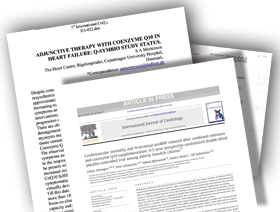 The study has just been published in the respected Journal of the American College of Cardiology (JACC). The study was first presented at a major cardiology congress in Lisbon and was subsequently the most cited on the Congress. The fact that JACC has decided to publish the study is according to Dr. Mortensen a breakthrough because it is one of the most influential journals for cardiologists. It also shows that JACC have emphasised the exceptional results with Q10 treatment. Q10 Pharma Nord has been chosen for the Q-symbio study because this is the brand that is used as the official reference product for the International Coenzyme Q10 Organisation. It has also been used in more than 100 published scientific studies. The product has demonstrated good bioavailability and effect, while also having collected safety data for the past 25 years. As the body will convert oxidized Q10 (ubiquinone) to the reduced form (ubiquinol) shortly after ingestion it usually does not matter which form of Q10 you use. Ubiquinone and ubiquinol constantly shift from one form to the other depending on the body's needs. To date, almost all documentation on the efficacy and safety of Q10 have been carried out using the oxidized form, ubiquinone, which is also the reason why Dr. Mortensen chose to use ubiquinone for the Q-symbio study.